One of the first colossal reels video slots to launch in brick and mortar casinos, Forbidden Dragons now gets the online treatment. Created by WMS, it’s a 10 reel, 100 payline game that’s played over 2 different reels sets. Extras on offer include wilds that transfer between the 2 reel sets and a free spins round where multipliers of 5x are on offer. Play on all devices from between 50p and £100 per spin. The set up in Forbidden Dragons is a little unusual. The main 5 reel, 4 row machine is joined by a 5 reel, 12 row set. Together they combine to offer 100 paylines. There’s a traditional feel to the design here. Joining the heart, diamond, club and spade symbols are jade statues, golden dragons and historical male and female characters. The green dragon and dragon face spin in stacked formation. Land 5 of the dragon face and you’ll pocket an award of 5 times your total bet. Helping to create the winners is the yin and yang symbol which is the wild. Land a full stack of these on the main set and it will copy onto the equivalent reel on the colossal set. For example, if you land a full stack on reel 2 on the main set then all 12 positions on reel 2 of the colossal set will also turn wild. All wins on the colossal reel set during the free spins round get boosted by a 5x multiplier. The wilds can transfer from the main to the colossal reels during the free spins too. The visuals in Forbidden Dragons are pretty typical of a WMS video slot. They don’t have the glossy sheen you’ll find from many other developers. The traditional backing track is a good fit though. 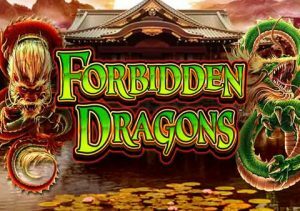 Forbidden Dragons started life in live casinos and that shows in this online version. The twin reels game engine take a little getting used to. The gameplay is actually very straightforward though. The appetite for all things Chinese shows no sign of abating. It’s not one of our favourites in this genre but the colossal reels make Forbidden Dragons worth a look. It can give you payouts of 2,500 times your bet on every free spin too which helps – if you like Colossal Reels video slots, you have Spartacus Gladiator of Rome from WMS and King’s Honour from Barcrest.